"KOKOKO! are a collective from Kinshasa, Democratic Republic of Congo, a creative collision of different artists which fused at a block party. 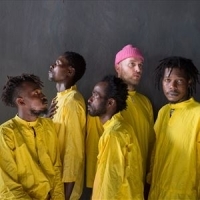 It consists of musical instrument inventors from the Ngwaka neighbourhood, electronic producer débruit, Makara Bianko (aka the Lingwala devil) and his dancers bursting forth from the Lingwala neighbourhood."